Cancer survivor and grass-fed cattle farmer Nick Wallace is our guest today in Episode 614 of The Livin’ La Vida Low-Carb Show with Jimmy Moore! 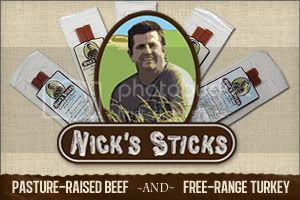 One of our fantastic sponsors in 2012 has been a real food-based grass-fed beef and free-range turkey snack stick products known as Nick's Sticks. The creator of these yummy low-carb snacks is Nick Wallace who has quite a story to tell about how he became one of the leading advocates for sustainable farming after once dreaming of a career as a baseball pitcher. But when he was diagnosed with lymphoma at the age of 19, Nick's original plans for his life were shattered. But what was borne in him through this experience instigated an intense passion and desire for real food sustainable farming that gives him more meaning and purpose in his life now than ever before. Listen in as Jimmy and Nick talk about how much life has changed for him since the cancer diagnosis and what drives him to get up every morning to work hard on his farm in Keystone, Iowa! DON'T MISS IT!